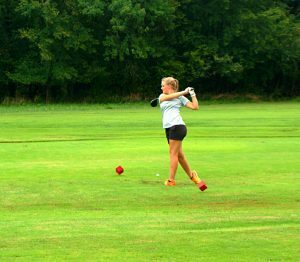 The Lady Trojan’s varsity girls golf team kept their momentum going on Thursday, winning their second straight tournament at Galena, which was played at Schifferdecker Golf Course in Joplin, Missouri. Each member of the team played a key role in the success of the Trojans, with four placing in the top 10. Senior Marci Heatherly and Gabbi Sands shined again as Heatherly finished 2nd overall scoring a 45 while Sands finished 4th with a 48. Junior Marcy McDonald came up huge as she finished 5th, scoring a 49. Fellow senior Bailey Leritz placed 8th, helping the Lady Trojan’s winning effort by scoring a 50. Just like their last tournament at Frontenac which came down to four strokes between first and second place, this meet brought the tension as well. 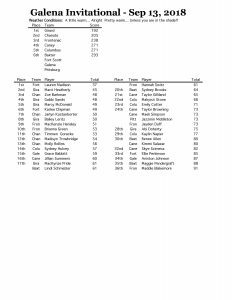 However, Girard was able to pull away with a much more comfortable finish this go around, beating 2nd place Chanute by 13 strokes. Full results below. The girls’ varsity team will compete at their next tournament September 17, in Chanute.